7 Amazing Places To Visit In Kyrgyzstan - Trip to Kyrgyzstan - destinations, tips, photo and video gallery. 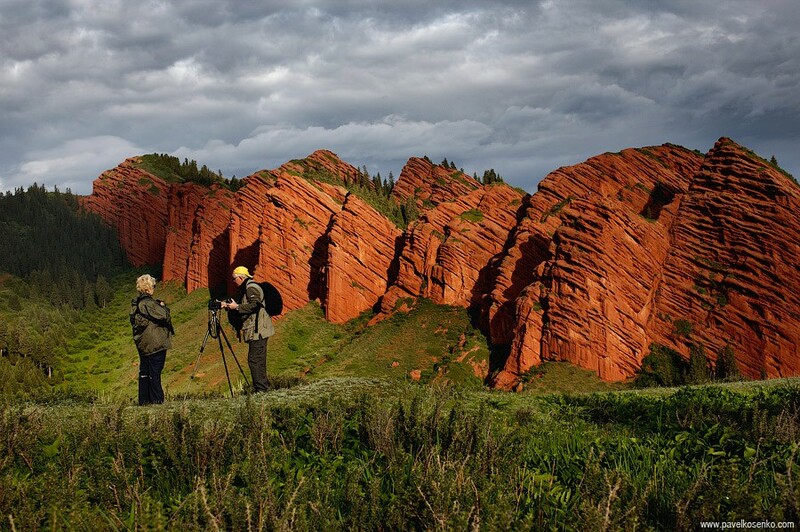 Considered as one of the most visited places in Kyrgyzstan, Jeti-Oguz is actually not disappointed at all. Local people call this historically formed cliff as Jeti-Oguz which means “Seven Bulls” in English. The cliffs stand with amazing view surrounded by pine trees, grass and of course beautiful mountain slopes. Once you arrived at the entrance, you will be amazed with the combination of the red-orange color of the cliff and green hills, especially in the morning. This place located in Issyk Kul province, northeastern Kyrgyzstan or about 28 kilometers to the south-west of Karakol town. This seven bulls rock has a legendary story where a long time ago, a king had many wives due to having much money. He saw a beautiful girl, fell in love and wanted to marry her. But, the girl was poor and already engaged with someone else. Her family runs away and finally, the king killed her fiance in order to be able to marry her. It becomes a phenomenal story in Kyrgystan that makes a symbol of Jeti-Orguz Canyon. Jeti-Oguz is not merely about viewing cliff or mountain, there are many activities that you do here. If you are crazy about hot springs, this place might be right choices for you to enjoy hot springs here. The hot springs water are believed to give you useful treatment for certain diseases due to its random and hydrogen sulfide content. If you want more adventurous activities, you can do hiking and even climb to the mountain surround the canyon. Some visitors also ride a motorbike to go everywhere around here while the other might prefer a car. You can choose and decide what are you going to do and what type transportation that you use depends on your need. Jeti-Oguz canyon is also one of prettiest place for both hiking and camping. The canyon has a beautiful river and sometimes you find a small garden and local village. Are you challenged to enjoy nature by trekking and camping in a beautiful place surrounded by amazing landscape? You should consider Altyn Arashan, one of the best places for outdoor activities like hiking, trekking, and climbing. 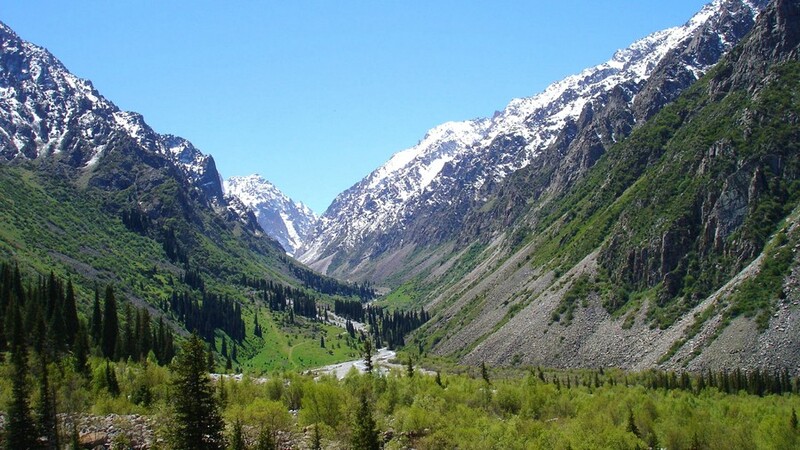 Altyn Arashan is Located in the town of Karakol and Issyuk Kul Lake, northeastern Kyrgyzstan. Normally, visitors explore this place for a whole package including trekking and camping which cannot be done in just one day. The trekking is started out from Karakol, then you will find an entrance with, pay the entrance fee and register yourself or your group. Hiking about 4 hours through the valley, you will pass and find small villages yurts along the way. You can also stop for a rest in these villages while seeing the daily life of local people. In addition, this place also offers beautiful waterfall, where most visitors stop to see this waterfall for a rest or to take a photo. Hiking in Altyn Arashan is the favorite thing and most visitors do here. Before you start hiking, you should buy a local map because sometimes you can not access your phone while you in this area. There are actually many spots for hiking, but it’s advice to start from the entrance of south Karakol. You should bring your own food supplies, a tent, a torchlight and a warm sleeping bag, especially in the winter. There are also many markets that sell foods such as mashed potatoes, cheese, bread, sausage especially if you do a 2 or 3 day of hiking. You can also find stores in town before the main entrance to buy your hiking equipment such as stoves, warm gear, etc. If you need a guide for a long hiking, you can find it in the town or right before the entrance. There are many tour agents that can help you to arrange your trip. However, sometimes the tour agent is quite expensive especially if you do hiking alone. It’s recommended to use a tour agent if you have a small and big group to make it less expensive. Could you ever imagine to see a directly magnificent lake with dramatic vibe landscape that you normally watch in movies? Song Kol lake has movies shooting place surrounded by mountains and broad summer pasture. This lake is the second largest lakes in Kyrgyzstan, making it as the most popular lake in this country. Most visitors usually reach this lake by horse, 4×4 and walking started from Kochkor and Naryn. The road is a little bumpy, so that’s why you should use a horse as the good alternative to walking while enjoying the beautiful scenery. There are no accommodation facilities nearby the lake, alternatively, you should build your own tent. But locals people nearby usually provides rent yours including meals for various costs. Beside camping nearby the lake, there are also some activities that you can do here such as trekking and climbing. Some people prefer enjoying the great view of the lake by climbing the mountain right behind the lake. Even though it takes several hours to reach the top, but the view will be worth it especially in the afternoon. A nonstop nature experience, Kyrgyzstan has so many magnificent hills and mountain to be explored. one of those is Sulayman mountain, the most popular mountain amongst the travelers. The name of Sulayman is taken from one of the Muslim prophets. This mountain is the sacred place for Muslim community which now used pilgrimage. it’s also a world heritage site and a must see place in Kyrgyzstan. It has five peaks and slopes which contains ancient places and caves with petroglyphs. What makes this mountain becomes phenomenal is that the fact the existence of two large mosques built in the 16th century. The visitors will amaze with the Islamic architecture as well as the historical story of these great mountains. As located in hilly places and canyon, Mountain Sulaiman has very special view especially if you can reach the very top of it. The combination of tough Islamic building and a mammoth craggy rocks makes this landscape even undeniable for travelers. However, the path is slippery especially when the ice drapes the steps that make you have to be careful. There is also an archeological museum that you will find here allows you to learn more about Islamic pilgrimage and artifact. In this museum, there is ceramic and metal works artifact nearby Osh made about 11th century. The museum building also represents the Islamic architecture. So, if you love visiting historical places, Sulayman-too Mountain might be your favorite place to visit in Kyrgyzstan. 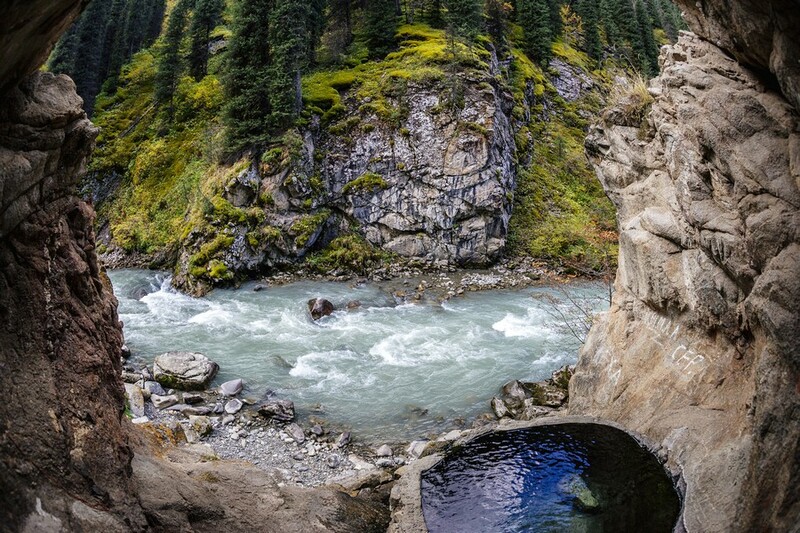 When it comes to the best natural places in the world, Kyrgyzstan might be one of those. Comprising with magnificent canyon, mountain, and lakes which is perfect for outdoor activities. One of the best outdoor activities that travelers do when visiting this country is camping, trekking, and hiking in Lake Sary-Chelek. This lake is different from the other typical lakes in Kyrgyzstan that offers glorious landscape with a mild climate. Surrounded by high mountains, these lakes is a home to diverse flora and fauna including some rare animals such as leopard. There are about 1000 different plants found here where some of them are the nest for various birds and mammals like a bear. The existence of the forest that makes this lake even more enchanting where you find walnuts, wild apples, grapes and pears here. As not much snow in the winter, this lake is perfect for camping and trekking. There are small lakes found around Sary-Chelek, especially if you go to the south of the lake. But the lakes are not recommended for camping on the bumpy ground that makes a little bit difficult to build your tent. If you prefer trekking or hiking, you can start from Arkyt through the wild western Chatkal mountains. Some people also start from Talas which need to cross mountain and valley with the more challenging trek. If you have never done trekking before, it’s suggested to start from Arkyt for an easier trek. You need to be accompanied by local people to reach the destination in a safe way. If you still do not know where to go in Kyrgyzstan, try to visit this place. If you are familiar with Kyrgyzstan, you might be ever heard about Issyk-Kul, as one of most tourist spot in this country. This area comprises magnificent landscape of mountain, river, and lake.located in eastern Kyrgyzstan closed to the border with Kazakhstan. the lake, as the main attraction is surrounded by dramatic mountain including UNESCO-listed Tian Shan Mountain range. These lakes are relatively easy to access especially if you start from the capital city of Kyrgyzstan, Bishkek. Whether you are an independent traveler or with the agent, actually this lake can be found easily.These lakes provide a marvelous view of rocky mountain combined with local residents in a village makes this lake more attractive. 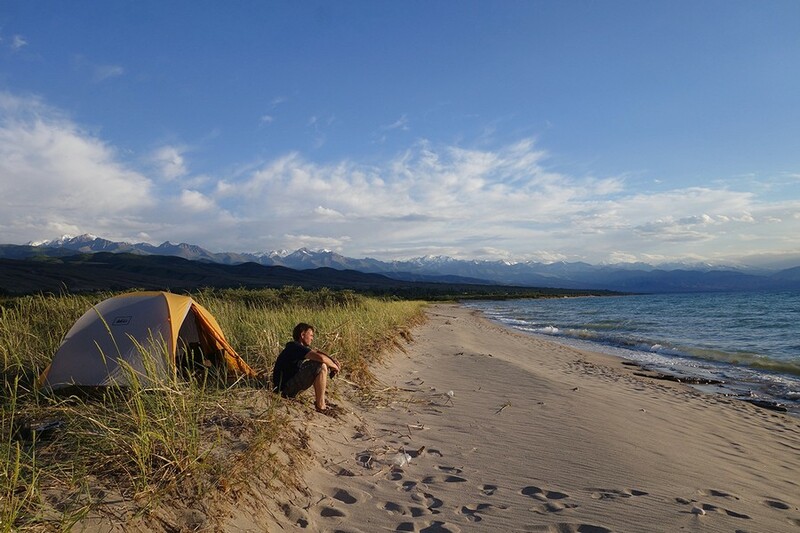 As the 10th largest lake in the world, Issyyk-Kul is 182 kilometers long and 60 kilometers wide. 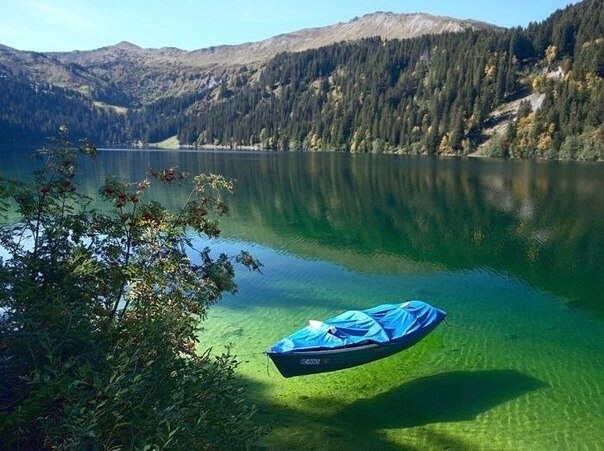 The water of the lake is not drinkable which contains the high mineral. However, local people believe that the water can be used as a treatment for certain diseases. 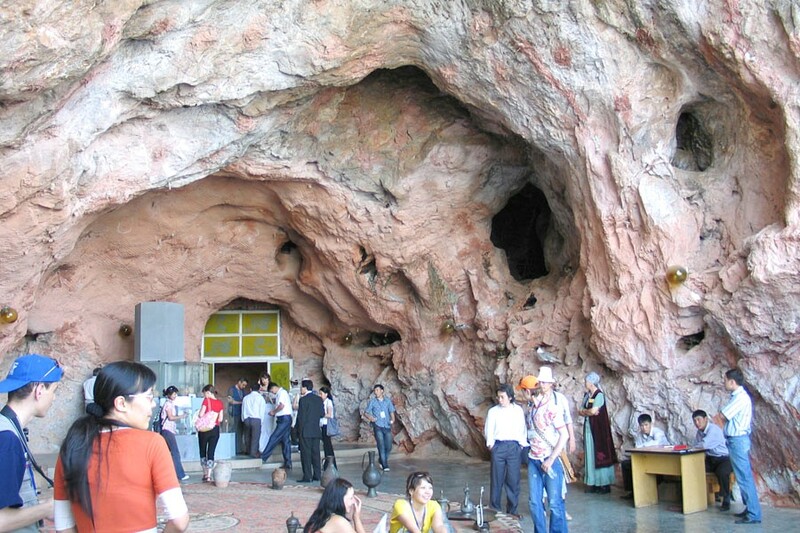 In holiday, you will find many local people visit this place in order to cure their diseases. Many activities that you can do here depends on what-what you need to do. Some visitors enjoy Cholpon-Ata, the famous town of the lake where you can play in the sun and drink beer. This town is also popular with its best resorts that provide any type of accommodation and activities. Most of the people also visit Issyuk-Kul for its magnificent beach holiday. The beach has beautiful landscape surrounded by mountain and pines trees. the warm weather especially in July, and the soft beach sand is a perfect combination of beach lovers. The existence of the resorts, make this place is also suitable for honeymoon. It has a more decent choice of accommodations too compared to other places in Kyrgyzstan. If you do not know where to go in Kyrgyzstan, you should visit this place, especially during summer. There is always a beautiful national park in a marvelous country like Kyrgyzstan. It’s ala archaic national park, located in the Tian Shan mountains or about 40 km from the capital city. The park comprises over 200 square kilometers and about 1,500 altitude ranges. The park has become in many ways the symbols of Ala-too itself. There are many things that you can find here, especially mountain, river, and waterfall. This park has more than 20 small and large glaciers and 50 mountains peaks that make this park is very amazing. The peaks are covered with snow rising above 4,500 meters.The landscape is, even more, enchanting with the existence of flora and fauna too. There is any type of plants that you can find here, and some species animals including bear and snow leopard. There are various activities that visitors can do here including trekking, hiking, climbing and even camping. The trekking is quite easy and accessible here especially if you start from Alsager hut. The trekking can be done almost 5000 m, even though many people stay near the lower reaches that are often used for picnics. There are more than 140 classified mountaineering and trekking routes, with various level of difficulties. The trekking should be done with a group, because of the bad unexpected whether may comes along the way. But, if you prefer a solo trekking, you should be well prepared especially if you want to reach the peak. Many spots that you can choose for trekking, including Ak-sai waterfall and rates basecamp trek. This is one of the most popular trekking amongst the visitors that offers you most demanding and dramatic canyon trail. There is waterfall along the way before you reach Ratsek hut with less than 6 hours. The beautiful canyon, waterfall, and glacier are perfect to be seen in this Restek hut. If you prefer climbing, there are also many spots and peaks that you can choose. There is three highest peak in this national park including Korona (4860m) and Semenov-Tyan-Shan peak (4875m) and Free Korea (4740). The climbing is quite challenging especially because the rocky hill that you will find along the way. Climbing is also favorite things to do here. There are many places to visit in Kyrgyzstan especially when it comes to nature places. That’s why there so many things especially adventurous activities that you can do here. Whether you are new to visit this country or you have visited before, there is always fun things to do and places to go.